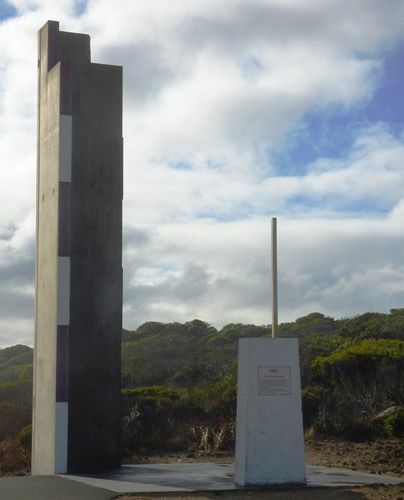 A monument commemorates the exploration of the Robe coastline by Matthew Flinders and Nicolas Baudin, and Robe's ongoing maritime tradition. The base of the monument is the exact size of the Obelisk where there is a viewing platform to the Obelisk, Doorway Rock and to the sea. The stainless steel panel on the back of the door is etched with the original maps of Robe`s coast drawn by Matthew Flinderrs and Nicolas Baudin. The four sided mast is engraved with the names of all boats that were fishing from Robe in 2002, and the French and English names for Robe`s coastal area. The Encounter Signal is a modern sculpture constructed for Robes Encounter 2002 celebrations to pay tribute to Robes ongoing maritime tradition and the exploration of Robes coast by English Captain Matthew Flinders and French explorer Nicolas Baudin. The sculpture was designed by Robert Spooner. The Encounter Signal was opened by Her Excellency Marjorie-Jackson Nelson AC CVO MBE Govenor (sic) of South Australia on April the 13th 2002.